We take pleasure to introduce ourselves as one of the renowned firms for providing the best-in-class range of Men Short. In order to meet huge market demand, we are involved in offering Men's Trunk Short. This Men's Trunk Short is available in the market at the cheapest rate. Our product is known for its perfect stretching. offer private labels , only highly interested wholesale clients can drop their inquiry please. We are one of the leading manufacturer and supplier of Mens short, We are suppling wide range of quality products with efficient pricing. Sudharshaan Impex presents highly durable range of Mens White Boxers, which is available in various sizes. 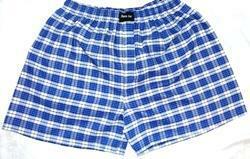 This pair of Blue Three Quarter Shorts is comfortable to wear and has a plain pattern.